Home Home-Featured Pope John seniors making school history! Pope John seniors making school history! Although, September isn’t usually the month when most high school seniors are making college scholarship decisions, three Pope John XXIII Central Catholic seniors find themselves making school history with multiple full-tuition offers already. Logan Henn, son of Denis and Jan Henn, Sydney Kerkman, daughter of Steve and Becky Kerkman and Marie Meis, daughter of Jim and Anne Meis, all of Elgin, have a total of six (NOW 7) University of Nebraska Regents Scholarship offers between them. Logan has been offered the scholarship at all three of the University’s campuses (Lincoln, Omaha and Kearney), Sydney had been offered the scholarship at both Omaha and Kearney, and Marie has been offered the scholarship at Kearney. UPDATE: On Monday, Sydney Kerkman was also offered a Regents Scholarship to UNL according to her mother, Becky Kerkman. 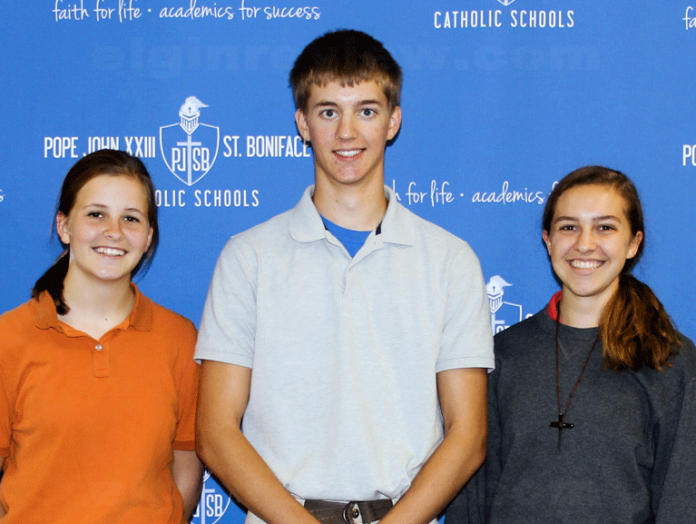 The Regents Scholarship is awarded to superior incoming freshmen who are graduates of Nebraska high schools. The scholarship is valued at full tuition for the completion of a bachelor’s degree. Based on 2017-18 tuition rates, the Regents Scholarship has a value of $32,062 at UNL, $23,968 at UNK and $29,193 at UNO. Altogether, the six (NOW 7) scholarships offered have a total value of $162,352 (NOW $194,414). “Pope John has never had so many students receive this many Regents offers, especially so early in the school year. It’s really a testament to the quality of students being formed here at Pope John and the individual work Logan, Sydney and Marie have put in.” said Pope John Principal, Betty Getzfred. Henn, Kerkman and Meis have all excelled at the ACT test, which was beneficial when being considered for the Regents Scholarship. The ACT is the nation’s most popular college entrance exam accepted by all universities and colleges in the United States. The ACT is based on what students learn in high school and provides personalized information about their strengths for education and career planning. Pope John school data from the past six years (2012-2017), shows that students at Pope John XXIII Central Catholic have exceeded both the state and national averages on the ACT. The state of Nebraska’s average is 21.4 and the national average is 20.8. During this time frame, the average scores for all Pope John seniors has ranged between 21.8 and 24.5. “We have been pleased with the consistently high ACT scores our students have received, as it’s one way to make sure they are prepared for college-level work and can do well at the next level of their education.” Mrs. Getzfred explained.